ALL ITEMS ON THIS PAGE WILL BE SHIPPED TO NORTH AMERICA ONLY! 1. Please furnish a telephone number on checkout. to add a U$10.00 handling fee to offset additional costs for international shipping. Camera and gentLED-Auto not included. They don't get any simpler than this! 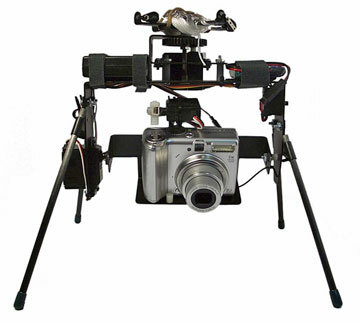 Brooxes Simplex is just a lightweight manually-aimed camera frame and Picavet suspension system, intended to carry a compact point-&-shoot camera. Use it with a camera that has its own built-in intervalometer, such as the GoPro Hero, or with a CHDK-converted Canon. 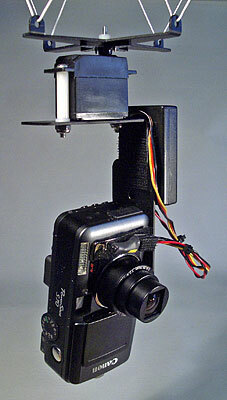 It can also be used with an infrared-triggerable camera with James Gentles' gentLED-Auto shown here. For smoothest operation, add PeKaBe blocks. Weight without camera or accessories 5 oz (142 g). Picavet Cross and line, KAP-Klips™, and hardware. The HoBEAK will accommodate any of the infrared-triggerable cameras listed above right. «I just received my order today, much earlier than I expected. I just wanted to write back and compliment you on wonderful prompt customers service, and I got [a] refund for overcharged shipping. Brooxes Electric AutoKAP Kit, in any of its variations, provides an easy way to get a camera in the air quickly, and add a bit of control. It's easy to build, and easy to fly with moderate-sized kites. AutoKAP means it doesn't need radio — it takes pictures automatically while you relax and fly the kite. The secret to KAP success with an automatic rig is to shoot lots of pictures. Memory cards are getting cheaper every day. With a 1GB or larger card, it's possible to shoot hundreds of images in a few minutes, from which you can pick a bunch of good ones at every outing. plus all necessary hardware and an illustrated instruction manual. Assembly of any of the BEAKs should take 1 - 3 hours. The standard BEAK is the simplest, lightest, and least expensive. 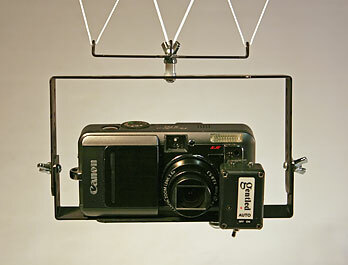 It is designed to use a small point-&-shoot digital camera, hung in portrait (vertical) format as shown. Camera must weigh less than 14 ounces (400g) and be triggerable by infrared or wired remote control or CHDK. 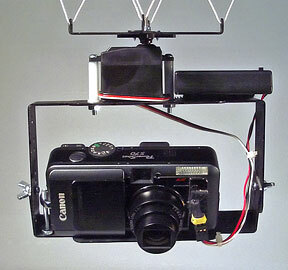 If your camera is not remote-controllable, you will need the Servo-BEAK below. Rig weight 5 oz (141 g) without camera. If you prefer to take automatic pictures in landscape (horizontal) format with one of the infrared-triggerable cameras listed above, build the HoBEAK [left]. All it takes is one more Utility Frame and a couple of screws and wing nuts. This configuration is a better one if you want to shoot straight down with cameras like the Canon S70, which has a tripod screw hole way off center. Otherwise: components, operation, and camera requirements are identical to the standard BEAK above. Infrared or wired remote control capability or CHDK is required! Weight 7 oz (200 g) less camera. See the CHDK Wiki for firmware downloads and details. of less than 5.5"wide x 4" high x 3.5" deep and 14 oz weight. Pan servo is hidden behind the battery box in this picture. 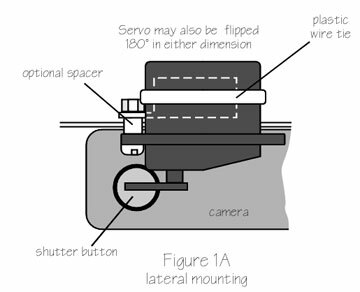 For the many point-&-shoot cameras that can't be triggered remotely, it's the Servo-BEAK. 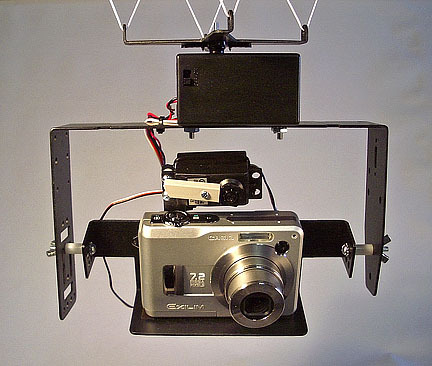 As above, you set the tilt before launching; the clickPAN-Servo pushes the shutter button with a servo-actuated finger, rotating the rig and taking pictures until the card is full or the batteries empty. Like the other BEAKs, this kit includes all necessary frame parts, both servos, battery box with switch, and hardware. All you provide is 3 AAA batteries, a camera, and a kite. Unlike the rigs above, the Servo-BEAK can be easily upgraded to radio or AuRiCo control with the addition of a tilt servo. Recommended cameras include all the Canon Digital Elphs, all of the Casio line, the compact Nikons, the waterproof Pentaxes ... or just about any small (less than 14 oz.) point-&-shoot digital camera on the market. Weight 9 oz (250 g) less camera. MAKE YOUR RIG EVEN MORE COMPACT! for the standard Picavet provided with your kit. This unit was designed to be used with one of the lightweight kits above, but it can be adapted to any kit on this page. NOTE: You must buy a kit at the same time in order to buy this upgrade! To upgrade prior purchases, buy the Folding Picavet from the Parts page. is the kit we started with, now in use all over the world. It was designed for radio control, using model airplane servos to provide 360-degree horizontal (pan) rotation, vertical tilt, and shutter control. But the BBKK may be also used without radio control with an interval timer, called an intervalometer. It will take you three to six hours to assemble using basic tools, depending on how complex you wish to make it. It is an adaptable, expandable system. BBKK may be used without radio control with most point-&-shoot cameras with the clickPAN-SERVO or AuRiCo controller, or with infrared-triggerable cameras using the gentLED-Auto . The kit will accommodate radio-control equipment with two to four channels, to operate pan, tilt, and shutter [see left]. The kit is designed to use Futaba S3003/3004 or Tower Hobbies TS-53 servos, but other standard-size servos should work too. Most finished radio rigs will weigh two pounds or less, suitable for use with such kites as a medium Parafoil or Flowform, the Fled, a medium-sized Rokkaku, or a 9-foot Delta or Delta-Conyne. Larger, more powerful kites are not needed, nor recommended. See our KITESTUFF page. 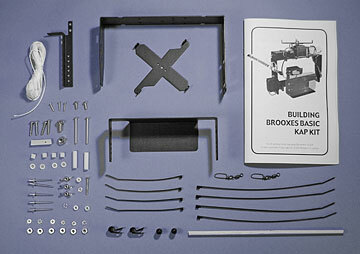 The BBKK package includes 70 pieces and a 20-page manual [left]. The kit may be purchased on this site only with U.S. nuts & bolts (also known as ANSI, SAE, or Imperial). 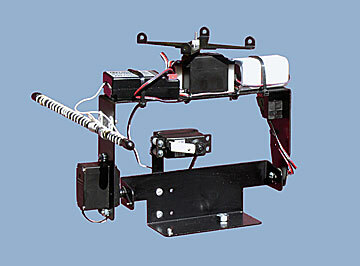 The BBKK includes the Parallax Continuous Rotation Servo. Also included are all aluminum frame parts, Brooxes Compact Picavet Cross, all fasteners & hardware, a set of KAP-Klips™, and complete, detailed, illustrated instructions. A typical illustration from the manual is shown at left. In addition, you will need tilt and shutter servos or some means of triggering the shutter, and a two- to four-channel radio control system, OR one of the controllers mentioned above — and a suitable camera, kite, line, and winder, of course. If you choose radio control, we recommend the Futaba 4-YF radio from Tower Hobbies, or the Spektrum DX5. To construct the kit, you'll need basic hand tools and an electric drill or small drill press. Click here to download a tool list. Weight of the BBKK less camera and batteries is 7 - 9 oz (200 - 250 g). 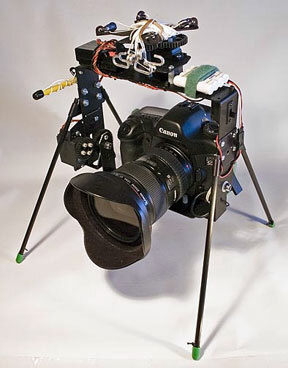 NOTE: This kit does not include a servo to tilt the camera. For heavy and/or deep cameras, such as an SLR with a long lens, a hi-torque metal-geared standard servo should be used. Otherwise, a standard servo should be adequate. Triggering the shutter may be done by a standard servo, miniservo, or suitable Gentles device. None is included in the kit; see the Parts page. The kit will also need a battery pack and power switch, usually provided in most radio packages or available on the Parts page. Weight less camera & batteries is 10-12 oz (280-340g). from Tower Hobbieswith Brooxes Deluxe KAP Kit. CAMERA & ELECTRONICS NOT INCLUDED. Substitute the Deluxe 1:4 Reduction Gear Package for the 1:1 Standard Gears in the Deluxe Kit above. 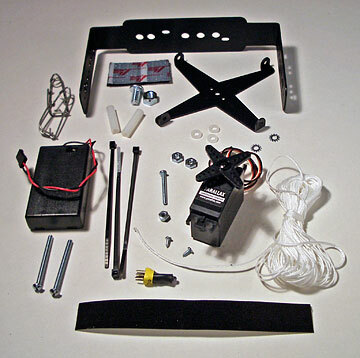 Picture includes additional components not included in the kit. Camera and electronics not included. We recommend using nothing larger than a small SLR for KAP (e.g., Canon Rebel), but if you must lift a big, heavy camera, you'll need this kit. BMKK is a variation on the Deluxe Kit, which substitutes Brooxes Maxi Frame parts, PLUS the Pan Gear Upgrade, PLUS long legs. NOTE! You'll need some means of triggering the shutter electrically, such as the gentLED-Shutter or gentWIRE-Focus, because the Maxi frame won't accommodate the normal shutter-servo mounting hardware. Also, a high-torque metal-geared tilt servo is recommended. Prices and specifications of anything on this page are subject to change without notice.